Everyone will love this ham and pineapple recipe. The fruit sweetens the dish and it is packed with flavour. Boil the ham for 1 hour on a medium heat, then remove from the water and allow to cool slightly. Place the ham on a rack set in a roasting tin. Mix 2 tablespoons of the honey with the mustard and vinegar in a small bowl, then brush the ham with this glaze and loosely cover the ham with tin foil. Transfer to the oven and cook for 1 hour. Remove the ham from the oven and cut off any tough outer skin and fat. 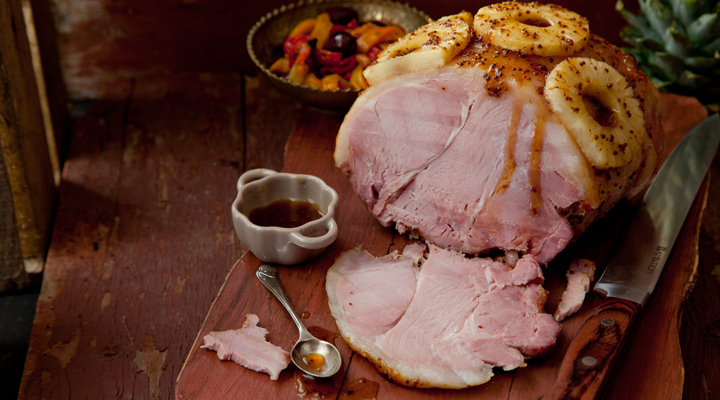 Place the pineapple rings evenly over the ham, then brush the pineapple with the remaining 3 tablespoons of honey. Return to the oven and cook for 30 minutes more, until the ham is fully cooked through.